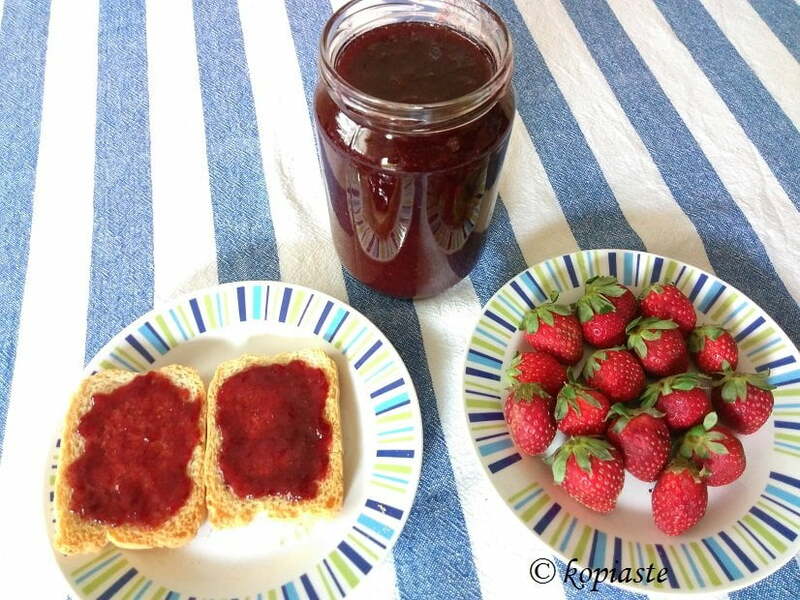 This is the easiest strawberry jam you can make and it tastes amazing! There are many recipes for strawberry jams which you can follow but in my opinion you cannot follow the same recipe always. My secret is to boil the jam in stages to achieve the right density. As some strawberries are juicier than others, it may take more time for the juicy ones to set. As the jam sets after it cools, start by boiling it for twenty minutes and let it cool completely. Continue for another ten minutes and let it cool again. If it doesn’t set, repeat this stage. When it sets, bring to a boil, add the lemon juice, mix and remove from the heat. If you have a candy thermometre then the procedure is much easier. The jam will be ready when it reaches 105 degrees C. Add the lemon juice and the jam is ready. The amout of sugar to add and cooking time will depend on how sweet the strawberries are raw and how juicy they are. A good ratio is 1 kilo strawberries and 1/2 kilo sugar, if you don’t want the jam to be too sweet, as I do. If the strawberries are tart, you can add 800 grams upto 1 kilo sugar, if you like it very sweet. As I like some chunks of fruit in the jam, I leave them whole if they are small or cut them in big pieces if they are big but you can cut them into smaller pieces if you like. If I add them whole, I just crush them with the wooden spoon to release some of the juice. The next step is to add the sugar on top and let them sit overnight, to release their juice and for the sugar to dissolve. Before putting it on the heat mix it to make sugar that the sugar has dissolved. As the jam boils, you will see foam forming on top. This is nothing to worry about as it is just air bubbes as the sugar boils. As your jam may overflow while it is boiling, keep a wooden spoon inside the pot or a wooden stick on top, as this will prevent it from overflowing. There are many methods to sterilize the jars. I have been making jams for many years and although at the beginning I used to boil the jars and lids the past years I use the washing machine. What I do is before using them, I wash them in the washing machine in the high temperature program (65C). I usually wash them in the evening and they stay in the washing machine all night. Would you believe that in the morning they are still warm? This has been working well for me for years but feel free to use whichever method you prefer best. This week I couldn’t resist buying some strawberries. I usually check the prices before buying and I spotted someone selling them with 2 Euros a kilo. This was a great opportunity to make some strawberry jam as the strawberry season is almost over. My friends Rosie, of Rosie Bakes a Peace of Cake and Pixie of, You say Tomahto and I say Tomayto are hosting their first event “Putting up” and they are hoping to make it a seasonal event. If you are into making jams and preserves there is still plenty of time until the 21st of May to participate and who knows you may win the raffle which will be a book on Jams and Preserves. Wash the strawberries with plenty of cold water and remove the stems. Place them into a colander so that they dry and then put them in a large pot. Add sugar and press them with a wooden spoon to release some juice. Cover with cling film and refridgerate overnight. The next day make sure that the sugar has dissolved and bring to a boil. When they begin boiling lower heat to the minimum and stir it once in a while. Simmer for 20 minutes and let it cool. Repeat this procedure until the jam sets. Put is back on the heat, add the lemon juice, stir and remove from the heat. Ladle in ½ kilo, sterilized jars. Clean the rim of the jars and screw on the lids. Put them upside down until they cool. How do we know if the syrup is ready? Not often you are right but you are right again sis. (Just teasing like sisters do:D) …I am jeolous. The temperatures are supposed to rise to 20C here this weekend and my family and Peter in the East are supposed to get snow…again.I always remember the juciest strawberries we found just outside of Ioannina. Love your jam. I will post my entry for “Putting Up” tomorrow!! This is not very good for us you know as it hasn’t rained much and in some years Canada will have a nice hot climate and here it will be like Sahara. Homemade strawberry jam is my favorite, Ivy. I often do a “quick” jam with a mix of berries and add it to my oatmeal of yogurt to brighten up breakfast a bit. Enjoy the farmers’ markets! Looks delicious! Jam is one of those things I’ve always wanted to make but never have gotten around to. You’ve inspired me. That has to be the best tip I read today! Sterilising your jars in the washing machine! Great jam Ivy. Strawberry is always a winner! @ Susan: I do that often as well and I love strawberries in my cereals or in the yoghurt. @ Ben: okay Ben I shall keep one for you for when you come to Greece. @ Elly: That’s nice to hear. It’s just the same around here as temperatures and rapidly growing and I fear we only have a few more days of spring left. Lucky you with the strawberries, you made such a wonderful jam! Your explanations are really important to me since I’ve never made jam before! Lore, most of the jams are done in the same way. Experiment with a small quantity choosing something cheap and see how it goes. YUM YUM YUM Ivy…may I have a jar? Delicious! Do send it over to Pixie’s & Rosie’s who are hosting a joint preserves event. YUM!! Deeba you can have the big one. You scared me. I thought I forgot to add the links to their sites. Already sent. Strawberries are now in season and I’m hoping to buy plenty on Tuesday so I can make that Jam! Looks wonderful, Ivy and thanks so much for explaining the process to everyone so clearly. Ta for participating, sweetie! Hi Carmen, thank you for dropping by. Well, I think you have a good chance of winning. Wow, it sure is cold where you live. There is a lot of good cooks out there making wonderful recipes but this time it’s a matter of luck as it’s a raffle. Thanks anyway. This looks like a great mermelada de fresas! I shall check how much the straberries cost here and be back… 2 Euros sounds so cheap!!! @ Rosie: I always make strawberry jam but if it wasn’t for your event I would have probably postponed it for later and who knows …. @ Nuria: I like the sound of mermeleda de fresas. The usual price is about 3 – 3,5 euros.